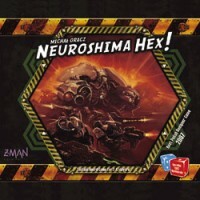 BoardGaming.com> Games> Board Games> Neuroshima Hex! Neuroshima HEX is a game of tactics, where armies wage continuous battles against each other. It is based on a roleplaying game called Neuroshima RPG published by Portal in 2001. While being familiar with the RPG is not necessary, the players will find it easier to identify with their armies if they have read or played the game. The world of Neuroshima RPG is that of a post-apocalypse world torn apart by a war between humans and machines. The remains of humanity took shelter in the ruins of cities and organized in small communities, gangs and armies. Conflicts between such groups are not uncommon and the reasons of such are numerous: territory, food or equipment. What is more, the ruined cities are constantly patrolled by machines sent from the north, where a vast cybernetic entity, called MOLOCH, appeared. Great wastelands that surround what was left of the greatest cities are home to another enemy - Borgo - a charismatic leader who controls an army of gruesome mutants. One of the last hopes of humanity is the OUTPOST, a perfectly organized army which wages a guerilla war against MOLOCH. Nevertheless, most human settlements, including the HEGEMONY, are not concerned with war until it comes banging at their door. Such is the world of Neuroshima. images © Z-Man Games Inc.
…players take turns placing hexagonal tiles covered with abstract symbols on a hexagonal grid, which, through the arcane mechanisms of their symbology, impact other tiles. And it’s FUN?! So what’s this game about? 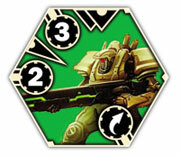 Neuroshima Hex is a tactics game, where the objective is to deal more damage to enemy HQs than they can deal to yours. Each of the 2-4 players controls a different army, with it’s own thematic strengths and weaknesses. The armies are based on factions in the post-apocalyptic world of Neuroshima, a Polish RPG with a rich history that translates to the board-game in the art on the tiles, a few little blurbs about the armies and… that’s about it. While the armies’ strategies do match the description of the factions and I’m sure the feeling of an all out battle would have been undermined if the armies were based off of My Little Pony instead, the theme is fairly negligible. I read the blurbs, but until I started writing tips for the game I only called the armies by their color; I had no reason to contextualize that Green against Red was really the newest offensive of the last standing human army (the Outpost) against the mechanical Moloch overlords. There are four armies in the game: the Moloch (red), the Outpost (green), the Hegemony (yellow), and Borgo (blue). Each army has 35 hexagonal tiles, including an HQ that confers a unique bonus to adjacent troops; a variety of units, which can attack or hinder the opponent; a few modules, which generally support adjacent troops, but may also hinder adjacent enemies; and a number of action tiles, which are played for an immediate effect (e.g. move an already placed tile). The game board is a regular hexagonal grid of side three (19 spaces total). Each tile has symbols which define their function. A unit may have either short or long triangles along any of its edges indicating that they have a melee or a ranged attack, respectively, in a particular direction. If a unit can attack, it also has an initiative, which determines the phase during which it attacks. Units may also have directional armor, which reduces damage from ranged attacks; a directional net, which completely disables an adjacent tile; or the ability to move. Modules can have symbols indicating that they boost the initiative of certain adjacent tiles, boost the ranged strength of all adjacent units or take damage in place of an adjacent unit, to name but a few things. Action tiles are just a single large symbol signifying that they either start a battle, move already placed units, or cause direct damage to specific enemies. All these symbols can be a little overwhelming at first and you’ll find yourself reading and re-reading the cheat-sheet for each army the first time or two that you play. Once you get a handle on them, however, they are super effective at making it easy to see exactly what a tile can do, which lets you focus on your strategic placement while keeping tabs on everybody else. Players take turns placing first their HQs and then their other tiles anywhere on the grid, oriented as they see fit. The typical turn begins with a player randomly drawing three of their tiles, discarding one tile and either placing/using their remaining tiles or holding them for the next turn. Some units have the ability to be moved and/or reoriented on the player’s turn. Aside from action tiles, which may cause direct damage to a unit, there is no interaction between the armies until it is time to do BATTLE! Battles occur either immediately when the last space on the board being filled or when a player plays a Battle tile (either way, it ends the player’s turn). The battle is conducted by initiative phase, starting with all the tiles with the highest initiative (the highest printed initiative is 3, but with modules and the Borgo HQ, you could get an initiative as high as 6). In each phase, every tiles’ attacks happen simultaneously, so all damage is applied before units are removed (if killed) and the next phase is started. This initiative system is the meat of the strategy in this game, as a unit with initiative 1 may be able to deal three damage to the enemy HQ, but it has to survive all the preceding initiative phases first, so positioning other troops or support modules to insure that this will be the case is important. Similarly, there might be an enemy positioned to block your ranged attack on an HQ, but if you can place something to kill that unit in a higher initiative phase, you’ll have a clear shot. The game ends when either there is only one surviving HQ or any player runs out of tiles. The person whose HQ has the most health left is the victor. What makes the game so much fun is that it plays fast and the tides of war are constantly in flux as players jockey for position. There’s a real tension when you’ve lined up the perfect assault and you’re not sure if you can launch it before your opponent can mount an adequate defense. On the flipside, it’s super satisfying when your enemy lines up such an attack and you move your HQ at the last minute or you net a couple of their crucial tiles, completing undermining their planned offensive. Even when this happens to you, it can’t be too disheartening when you know you’ll be starting a new game in 20 minutes anyway and maybe then you’ll be in a position to exact your revenge! This is based on an RPG of which I’ve never played or know what is about. I’m mentioning this to explain the reason why the four factions avaliable are totally different to play. 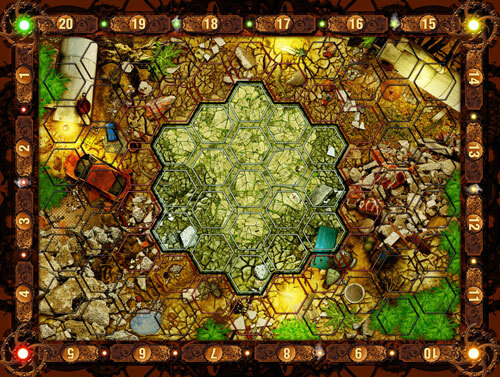 The game supports 2-4 players, and the board consists of a 3*3 grid, making out the form of a hexagon. Each player chooses a faction to play, and there are 4 factions to choose from. Expansions permit more factions to choose from, but there are no official rules for more than 4 players. Each faction has very different abilities, based upon the faction background in the RPG world. You don’t need to know anything at all about the backstory, but you may read a quick summary on the backside of the handout. The handouts also include a nice tip for beginnes playing exactly that faction, plus a very nice, condensed overview of all the pieces. Each player puts out their HQ. Each HQ has 20 hitpoints. When a players HQ reaches 0, that player is out of the rest of the game. As you can tell, it’s all about attacking other players’ HQ, and surviving. The game ends when there’s only one player remaining or if a player is out of tiles to draw. A turn consists of the following: draw up to 3 tiles from a stacked pile of tiles. These are all showed to the other players. One of the tiles must be discarded. The two others may be saved for a later round, or he can choose to play one or both, and even discard them. If the player places a tile so that the board has no free space or if he plays a special battle-tile, a battle commences. Each battle is fought after an order of initiative. The initiative is printed on each unit, and each unit that has the same initiative, plays simultaneously. This means that two units fighting eachother at the same initiative will kill eachother. The highter the initiative, the earlier you get to go. Each HQ has an initiative of 0, but they also have the largest attack area. Because the factions are so different, each players choices and tiles will be different than yours. And that makes the game unpredictable and fun. You can never plan far ahead, since a lot of things can happen before you go again. Suddenly someone decides a battle is to commence, and when it’s your turn you might have no units left on the board. Or you have a great advantage all of a sudden. – Has a great iPhone/iPad-app! Two to four players, best with two, good with any amount. About half an hour to play, longer with more players. A hex-based, tile-laying, post-apocalyptic strategy game. How much better can it get? It plays well with two, uses variable player powers (think Starcraft’s Zerg, Terran, and Protoss, and you’re halfway there), and has a hand-management mechanic that gets the brain burning. For more casual strategy gamers I’ll pull out Small World, but if someone wants a challenge, out comes The Hex. Neuroshima Hex is actually based on a Polish RPG (Neuroshima) set in a story-ridden post-apocalyptic world of robots and mutants. The Hex itself reeks of background, with fully half of the player aids devoted to the place your team holds in the RPG. Fortunately the game plays just as well without that background, and it just serves for some light flavoring. Each turn, the active player draws some hexes from their deck, discards at least one hex, and plays some hexes. Some of your hexes are units, which you play by positioning them on an empty space on the board, where direction matters. Other hexes are actions, which you play by acting, then discarding the hex. Note that there is no combat phase. Hex is big on positioning. Your board position is often very static (though some races change that a bit), meaning that the decision of how to rotate a piece can make or break the game. Pieces have triangles on them to notate the direction and strength of attacks — one short triangle points in the direction of a melee attack that does one damage, while three long triangles point in the direction of a three-damage ranged attack. Different races have different units available, including brawlers that do melee damage to three adjacent sides, and net fighters that disable a unit on one side of them. The board state can quickly get complicated when you have four players. You play until you run out of tiles or until someone hits 20 damage/VPs (which rarely happens in my games), making a built-in time limit that keeps things short and play tense. The tile pile has other effects on the game, as well — the number of each tile in your deck is public information, and everyone knows what you’ve seen, what you’ve discarded, and what’s in your hand. If you’ve gone through all five battle tiles in your deck, they know that you can’t initiate another. If you’ve used your single sniper tile, people no longer need to play around it. If both players in a two-player game have gone through all their battle tiles, the rest of the game can be rather boring. Fortunately, you get one last battle when the game ends, ensuring that things get a final shake-up. Play with three or four people has interesting issues — if you play for HQ damage, you get player elimination, which can be generally unhappy. The game’s time limit mitigates that problem somewhat, though. If you play with damage-as-VPs, one player’s HQ could end up out in the open, basically just acting as a VP farm and a degenerate strategy for the other players. With four players, playing on teams mitigates this quite a bit. In all, recommended for anyone looking for an interesting strategy game to add to the collection. Neuroshima Hex plays well with two, putting it into an elite group, and can be played in under an hour, making it more unique still. It’s a tile-placement hex game to boot, and the different races give each game a different feel. Give it a shot with your Chess or Go buddy, and let me know what you think. Neuroshima HEX is a non-so-abstract strategy game. The flow of the game simulates a battle between futuristic armies; there may be 2 to 4 of them each lead by a player. I have to say that the game scales well with the number of players, however it feels different for each of these possibilities. I like it for 2 players the most because this is the variant when strategy and tactics clearly dominate luck. For 4 players the fun factor grows while the tactics factor lowers (yet the long term strategy factor seem to stay still or even grow a bit). The problem arises for 3 players as a kingmaker dilemma often appears. There are some not too obvious resemblances with Chess here. The victory condition is pinned to one unit the HeadQuarters. The object of the game is either to destroy all opposing HQ-s while protecting one’s own or to stay with least damage dealt to the HQ when the time of the game ends. Another similarity is that player’s units have variable powers. But the parallels end here, there are a lot of substantial differences: For example not only the position of a unit matters but usually also its orientation does. Moreover the order the pieces move and attack depend on their relative initiative value (so they depend on what other units are on the board). The most important feature is that each player has an army much different than their opponents. Each of the sides of conflict has its pros and cons; one faction may have swift but weak units while the other may deploy slow but powerful ones. For one army an offensive tactics may be optimal, for another one a defensive strategy could possibly bring much more. What is important: the factions are well balanced! I played quite a few games of NH and I know players who players tens of times more than me – and they claim there is neither a clear leader nor any obvious underdog among the factions. Neuroshima HEX requires some time to learn and more time to master but it provides a lot of valuable entertainment. NH is a tactical abstract with 4 variable power armies that plays distinctively and can be finished under 45 minutes with 2 players. Supports up to 4 players but I believe it is ideal with 2 players. May require minimal experience with hex wargames and understanding concepts like range/melee, initiative and line of sight. My 6 year-old started with Heroscape and easily transitioned into this game. We actually shelved the physical game in favor of the tablet version (our #1 “find-a-bench-while-the-wife-shops” game) so if you are looking to quickly scratch a hex-n-counter tile placement itch, I would highly recommend NH. Neuroshima Hex is a themed abstract strategy game set in a post apacalyptic world. Tiles are placed on the board, each representing a soldier or an upgrade, ususally the former. Each tile indicates which direction it attacks, whether it’s short or long ranged, how much damage it does and other special abilities. There are also HQ tiles, which can sustain more damage. The goal of the game is to do 20 points of damage to the opponent’s HQ. There are four factions, The Outpost (human survivors), Moloch (a Skynet-like supercomputer with an army of robots), The Hegemony (biker-barbarians), and Borgo (mutant savages). Each army has a unique deck of tiles, each deck speciallizing in a particular style of play with their own strengths and weaknesses. Play is quick and challenging, as each tile laid is mostly static and can only be moved with special tiles that act as powers, not laid on the board. Tiles only attack during a combat phase, which is triggered when the appropriate tile is played. Thus, super-awesome Hunter-Killers don’t automatically slay the humans until combat is triggered, then all units attack in order or initiative. Basically, there are several turns of preperation followed by a massive, bloody firefight, then more build-up until only one HQ remains. In short, Neuroshima Hex is a clever game that offers lots of options and surprises. However, the rules are a bit odd and teaching someone to play is difficult. Many tune out half way through the first game. But those that are used to euro style games and/or love sci-fi will stick it out. THis game is supposed to be easy and as close to abstract as one can hope for of a thematically oriented game these days. But instead you get a really confusing and hard to follow game that will frustrate you each time you need to go to the rules to understand what all the small icons on each game piece does. First time I played it was with a couple of friends that told me they knew the game. Then it was really fun and easy. After that I got it myself and played it as I was taught. After a while I read the rules and figured out that my dear friends probably hadn’t even opened the rule book themselves. I think it has a lot of potential but it really needs to be tweaked a bit and the icons on the game pieces needs better visuals and rules. I would not recommend this as one of your first games. Add a Review for "Neuroshima Hex!"